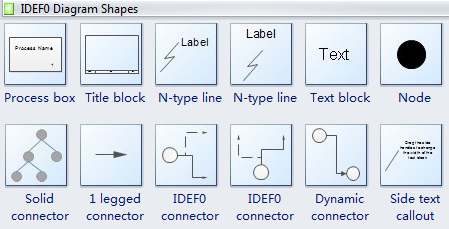 IDEF0 Diagram Software - Create IDEF0 diagrams rapidly with examples and templates. IDEF0 Diagrams Software - Create IDEF0 diagrams and business diagrams rapidly with rich examples and templates. Provide some IDEF0 knowledge. IDEF is based on the Structured Analysis and Design Technique (SADT), a graphical approach to system description, introduced by Douglas T. Ross in the early 1970s. Since then, system analysts at Softech, Inc. have refined and used SADT in a wide variety of problems. In 1981, the U.S. Air Force Program for Integrated Computer-Aided Manufacturing (ICAM) standardized and made public a subset of SADT, called IDEF. IDEF0 diagram was originally used to apply structured methods to better understand how to improve manufacturing productivity. IDEF0 was initially created at Northrop Corporation in 1966, and first available commercially by SofTek in 1972. An IDEF0 activity diagram contains one level of decomposition of a process. Boxes within a diagram show the subprocesses of the parent process named by the diagram. Arrows between the boxes show the flow of products between processes. Edraw Max is an easy to use IDEF0 diagrams software, which creates IDEF0 diagrams and business diagrams rapidly with rich examples and templates. Build hierarchical diagrams using IEDF0 process charting models for model configuration management, need and benefit analyses, requirements definitions, and continuous improvement models. Context diagram - The topmost diagram in an IDEF0 model. Parent/child diagram - An IDEF0 decomposition hierarchy using parent/child relationships. Node trees - Tree-like structures of nodes rooted at a chosen node, and used to represent a full IDEF0 decomposition in a single diagram. Understanding - modeling helps discover the nature of the business being modeled; that is, what is being done in the business. Communication - once understanding has been reached, the nature of the business processes can be documented and these documents easily communicated. Enlightenment - modeling helps to uncover anomalies, redundancies deficiencies and inefficiencies in the existing (as-is) business process. Improvement - a model allows you to select deficient areas of the business and its processes and improve them. Redesign - a model provides a tangible basis for redesigning the process, performing simulations of the redesigned (to-be) business process as defined by the strategy. This means that strategies can be tested before implementation takes place. An IDEF0 model represents the activities of the business from the point of view of the business, how those business activities interrelate, resources used to conduct each activity, and the result or output of each activity. The model consists of graphics and associated text supporting the graphics. The IDEF0 modeling technique consists of a graphic language and a modeling process that can be used to develop a rich process description. It is an intuitive way to define, analyze and document the business as a whole and the processes of the business. The IDEF0 notation was standardized in 1993 by the National Institute of Standards and Technology of the United States Department of Commerce and is a public domain methodology. IDEF0 is a subset of the complete IDEF0 system modeling methodology which includes process and information modeling. There are a number of business process and information modeling notations around. Most of these are part of proprietary methodologies developed by consulting firms. IDEF0, being in the public domain, is dismantling the Tower of Babel to the point where a model's main purpose and communication can now be achieved. The modeling of the entire business and its processes is especially difficult because, even in small- and medium-sized businesses, business processes are complex and referred to as being of medium complexity. The IDEF0 method facilitates the modeling of the business as a complex system so it can be understood and improved. IDEF (Integrated Definition) diagrams were introduced in 1981 as part of the Integrated Computer-Aided Manufacturing (ICAM) project. There are numerous IDEF methods, but two of them serve as the basis for business process models: the IDEF0 method that focuses on activity modeling and the IDEF3 method that accomplishes process description and can be used to rapidly generate discrete-event simulation model specifications (Mayer et al, 1998). The IDEF0 method is designed to model the decisions, actions, and activities of an organization or other system and is targeted to communicating and analyzing the functional perspective of a system (Mayer et al 1998). IDEF0, which is mainly concerned with what activities the organization performs). Similar to IDEF0, the main strength of IDEF3 is the simplicity of its notation, which relies on only one basic construct, called the UOB (Unit of Behavior). It's easy to start IDEF flowchart from existing examples or templates. Right in the software, you can find well-built IDEF flowcharts that you can use.